The “conspiracy” was really a cover story for Robespierre‘s boys to wield their purifying torch against prisons and (of course) tighten the grip of authority by wild reference to treasonable plots abroad. Supposedly, the prisons had birthed a scheme to effect a mass escape further to some sort of counterrevolutionary insurrection, or assassination of Robespierre. Marvelously, these conspiracies simultaneously spanned most all of Paris’ prisons, and their “authors” formed a dominant demographic among the Terror’s last tumbrils as the authorities purged each prison in turn. While we have tarried to profile select victims individually this week, we have in fact repeatedly met so-called prison conspirators. Luxembourg Prison — whose warders had concocted the earlier “conspiracy” involving Camille Desmoulins’ wife — had been purged repeatedly earlier in the month; its last spasm swept up the Noailles women. An efficient detour to the Carmelite Monastery converted by revolutionary Paris into another gaol netted Alexandre de Beauharnais. And the first batch of St. Lazare Prison felled Andre Chenier, where, as elsewhere, dozens were punished for some impressively villainous designs. Being convicted of having declared themselves the enemies of the republic, by keeping up communications with the enemies of the state; by furnishing them with assistance; by participating in the plots, conspiracies, and assassinations of the tyrant and his wife, against the people; by conspiring in the maison d’arret (lock-up house), called Lazare, to escape, and to dissolve, by the assassination and murder of the representatives of the people, and more especially of the members of the committees of public safety and general security, the republican government, and to re-establish royality; — in fine, by wishing to destroy the unity and indivisibility of the republic. 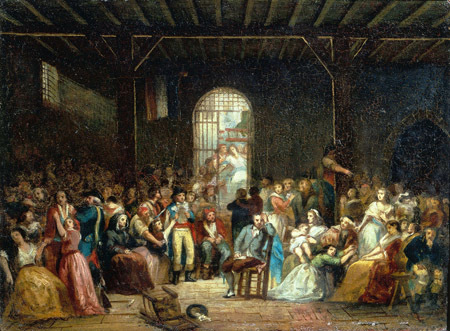 Charles-Louis Muller’s 19th century painting of the Saint Lazare Prison “conspirators” being summoned to their doom. Seated in the center is Andre Chenier. Each of these famous figures is a noticeable face among dozens of hapless wretches, largely drawn from the Third Estate and often laughably implausible escape artists and assassins — such as, among this day’s victims, an 80-year-old priest. The most poignant fate among the many forgotten threads threads of life clipped short is undoubtedly one Jean Simon Loizerolles, who was imprisoned with his son. On the 7th Thermidor, about four o’clock, p.m., the bailiff of the tribunal presented himself at the prison with the mortuary list, or, in other words, the death-warrant. Loizerolles was called for: it was Loizerolles, junior, whom death surrounded. Loizerolles, the father, did not hesitate to present himself; and, comparing his sixty-one years to the twenty-two years of his son, he determined to give him life a second time: the father went down, and was conducted to the Conciergerie. He there received the bill of accusation, drawn up by order of the Committee of Public Safety, and headed Prison Conspiracy. This bill bore the name of Loizerolles, junior. The next day the father appeared for examination, with his twenty-five companions of misfortune. The bill of accusation, which was joined to the depositions, stated that it was Francois Simon Loizerolles, junior, aged twenty-two. The declaration of the sentence, prepared in anticipation upon the bill, bore the same designations. The recorder contented himself with effacing the name of Francois, and putting above it Jean. Finally, the questions submitted, for the sake of form, to the jury, and drawn up in anticipation upon the same bill of accusation, contained the names and the designation mentioned in the accusation. But, at the time of the trial, when the charge was made to the jury, Coffinhal took care to efface the name of Francois, to substitute that of Jean, and to erase te word son, which was replaced by the word father. He rudely altered the two figures from twenty-two to sixty-one, and added the former profession of the father, which the accusation did not state. And Jean Simon Loizerolles, against whom there was no accusation, was put to death on the 8th Thermidor. Loizerolles is renowned for nothing in life save the touching valor of his death, but his name was a watchword for paternal devotion in France in the 19th century; Jadin wrote a short opera to his honor, and Victor Hugo references Loizerolles (bizarrely side by side with Robespierre’s younger brother) in Les Miserables as the sort of paragon of loyalty disdained by a gauche skeptic. But the gambit worked: Loizerolles junior survived the last days of the Terror, and was later pensioned by Charles X. For every triumph, there were countless tragedies. The prisoners had wind of the enterprise to decimate their number days before; an anonymous account printed here (also the source of the Loizerolles story) describes a ramping-up of abuses great and petty in an effort to provoke a rising that would license a bloodbath, and the fear and desperation of the prisoners as death circled them. Our melancholy and dejected hearts prepared themselves for death. The prison appeared surrounded by a funeral veil, and the death-like silence which pervaded it produced a dreadful feeling of misery in its inmates. Games and amusements were banished from the grounds, and our cadaverous countenances afforded an index of our afflicted souls; the refectory, which was wont to inspire a sentiment of cheerfulness, became a meeting of moving spectres, who quitted each other without exchanging a word. The prisoners at St. Lazare could no longer indulge in illusions on the fate that awaited them … old age and infancy had ceased to be respected; all were alike condemned as guilty of the project of escape; and the man who was the most harmless and the most devoted to his country was no longer exempt from accusation. But there was a small favor: a third repetition of the scene was postponed two days, which turned out to be all the difference between life and death. [T]he Robespierrists, delighted in perpetuating our terrors, announced that the tragic scene would be renewed on the 10th. In this deplorable situation we saw no end to our sorrows but in death; and, however terrifying the grim visitant may naturally be, yet we deemed his arrival too long delayed, and invoked his coming, while we regretted that we had not been of the number of the first victims. When, about ten o’clock, p.m., of the 9th Thermidor, it was reported in the prison, that Robespierre was formally accused, the news, which had been brought by three new prisoners from without, inspired distrust, and savoured too much of the miraculous to be easily believed. The following morning … the information was confirmed … in such a positive and circumstantial manner that we could no longer entertain a doubt of its truth. It may easily be conceived how sudden was the change which was effected in the prison of St. Lazare: the prisoners began, for the irst time, since the 5th, to breathe more freely; their hearts, which had been so long cast down, received a fresh inspiration; their countenances cleared up; the full use of their suspended faculties was restored; and the images of death, which had affrighted them, were dissipated; and if they could have forgotten the assassination of their companions, they might have entirely lost the recollection of their misfortunes. Il parla de vertus, et commit tous les crimes. He spoke of virtues while he swam in crimes.